Awards for Young Musicians is an arts charity which aims to help talented young people to further their musical development. Whether you need help with music lessons, instrument purchase, orchestra fees, course fees or travel, AYM endeavours to help gifted musicians between the ages 5-18 in the UK. For me, applying to AYM was one of the best things I ever did to further my musical development. The financial help which they provided was absolutely key in helping me to buy my violin. What was even better is that they kept in touch with me and have helped me in furthering my personal development as a mentor in their recent mentoring programme: Talent to Talent. I feel so fortunate to have been involved with such a wonderful organisation run by phenomenal people. I applied to AYM twice and fortunately they gave me a substantial sum of money to go towards the purchase of my new violin. Their contribution meant that I secured the violin with the dealer. It took me over two years to finally make the full payment for the violin but I did it. It was a very uplifting experience knowing that there was a charitable organisation that was willing to support someone like me who needed an new instrument but didn’t have the funds. It meant that I didn’t have to give up on any of my aspirations or settle for an inferior instrument. My violin really elevated my playing and boosted my confidence as a musician. Having a new instrument truly help me along to develop my skills and grow. I didn’t have to try as hard on my new instrument as I did on my old violin. AYM is amazing at keeping in contact with their award winners to see how they’ve progressed. They reached out to past awards winners now alumni to give them an opportunity to take part as mentors in Talent to Talent. A completely new project, Talent to Talent was peer-led mentoring from AYM alumni to current award winners. The programme was actually three-tiered so I was an alumna who was mentoring a current award winner who then went on to mentor a furthering talent student. The alumni included musicians who were at music college; some at the end of BMus going into masters or work; some like me at the start of a degree and some who were actually working and living as freelance musicians. The award-winners were as it suggests – current or recent recipients of an award from AYM. The furthering talent students were young musicians at the beginnings of their musical journeys and had been identified as those with emerging potential and high aptitude learners. The whole point was to get 45 young musicians at different musical stages to encourage, mentor and support each other. I couldn’t pass the opportunity to gain training and experience in something that would benefit me and someone else. One of the mains reasons why I applied to be a mentor in the project is because I wish I had a mentor when I was younger. I came from a background of not really knowing much about going in to music or even the dos and don’ts of applying to a music school etc. I really would’ve benefitted from an older more experienced musician who could offer me advice and encouragement. 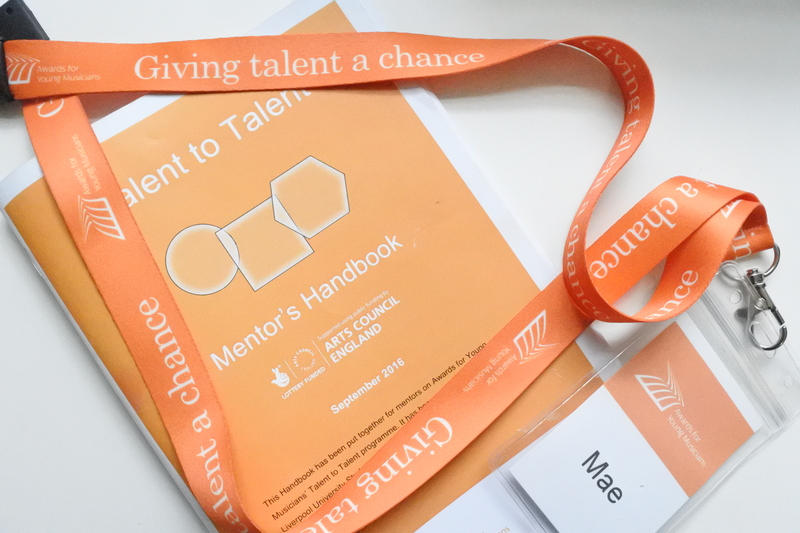 With Talent to Talent, peer-led mentoring was really effective because it meant that being closer in age we could be easily relatable and we were the bridge between being a student and their teacher. Also, I believe that I share similar views to AYM on encouraging and supporting young musicians and I wanted to give back even the smallest portion of support to someone else in the same way that AYM has supported me. The process was unique and unlike anything I’d ever done or heard of before. In retrospect, it seems a little obvious that musicians should be receiving regular mentoring but thanks to AYM, they’ve pioneered a fantastic project. For me it was great to meet more like-minded musicians who were in different stages. We had a training day which included safe-guarding and all the important practical information about working with young people. We had excellent people who provided the training and advice on mentoring, so we learned from the best! The training day was vital because it really caused us to think and understand the difference between mentoring and teaching. What was great was that my mentee was a cellist so I wasn’t tempted to try and talk about technical issues like bowing and fingerings! For me, the beauty of mentoring was in the fact that it was definitely a two-way process and even though I was the adult in the situation, I learned an awful lot from my mentee and I also learned a lot about myself. Sometimes, I didn’t always have the answers but that was ok. I just had to do some more research and broaden my knowledge in order to help my mentee and we could even learn together. Mentoring definitely benefitted me in numerous ways including: helping someone else in their musical journey; developing people skills and emotional intelligence skills; taking time out of my schedule to help someone else. The programme ended with a final group day at Richmix in London where we all composed our own performances to illustrate the mentoring process and journey. There, we also had the chance to interview and be audience to a performance by singer-songwriter-cellist Ayanna Witter-Johnson. Finally, I was invited to make a speech to the AYM Angels at Clementi House in Notting Hill on 26th April. The house was amazing and transported me back to 18th century, as if Clementi himself were still living there. The AYM Angels are the phenomenal people who donate and support AYM. I’m so grateful to have been a part of such a lovely evening. It was a rare opportunity for me to meet and talk to people who truly enjoy helping and supporting young musicians. I came away feeling really high in spirits about the future of classical music and it’s young musicians. Speaking to the AYM Angels also gave me so much confidence with public speaking and sharing my enthusiasm with others. I can’t say thank you enough to Hester, Hannah and the rest of the amazing team at AYM for their fantastic work. If you are a young musician, parent/carer of one or you simply know of a young musician please check out AYM and be sure to make use of their services if you’re eligible.